Pattern Imprinted Concrete driveways, patios, paths require minimal maintenance. However, we do recommend re-sealing every three to five years. The frequency with which you should reseal your Pattern Imprinted Concrete driveway is specific to each installation, and depends on many factors. Our installation experts will advise you on maintenance timescales specific to your driveway. 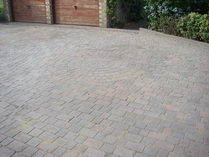 Re-sealing rejuvenates and protects your pattern imprinted concrete driveway. 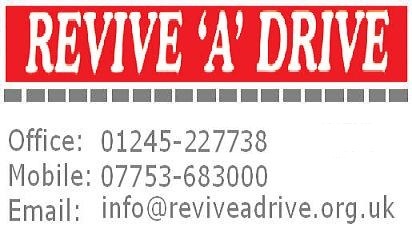 The Revive-A-Drive process can also be applied to slabs, slate, crazy paving, tarmac, decking and even brick walls. 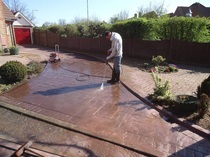 Tarmac driveways and slabs can also be re-coloured if required. We offer a complete professional service of bringing tired and worn paving black to life. This could be far less than the cost of a full replacement. All of our coatings and materials are of the highest quality designed to resist extreme weather conditions, oil staining whilst renewing both the colour and appearance. 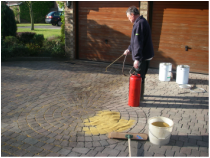 Your pattern imprinted concrete driveway must be bone dry in order to be able to re-seal it correctly; therefore it’s best to re-seal in the warmer months. On the image on the left, you can see where this Pattern Imprinted Concrete has faded after many years but by resealing the surface it has immediately brought the life back into the surface and will last for many years to come again. We now offer reseals and maintenance not only to customers who have had their drive fitted by ourselves, but to all Pattern Imprinted Concrete owners. Through general wear and tear, Pattern Imprinted Concrete will lose some colour over time and the concrete underneath may become exposed. We can restore patterned concrete to look very close to how it was when first laid.The refurbishment process for pattern imprinted concrete is fairly straightforward. Firstly it will need jet washing with one of our powerful rotary headed cleaners to remove any surface dirt or weeds that may be present. Depending on the colour and condition of the imprinted concrete it may also require some re-tinting. For badly worn areas and chipping. we can renew the surface with a coloured bonded resin compound. A high quality sealant is then applied to the surface to keep the imprinted concrete looking good and to prevent future loss of colour. Weeds in your block paving? If you've got weeds in your block paving, we can help. 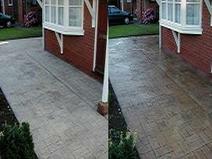 This service includes the refurbishment & sealing of block paving driveways. Over time tiny seeds get into the gaps between your paving blocks and will eventually grow to create those awful green edges between your paving. Do you really want to have to keep digging them out every weekend? 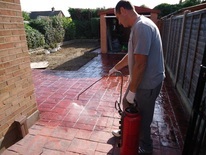 Bring back to life your weed infested block paving with a high pressure cleaning process followed by a re-sanding of the joints. Stops that weed growth in future! 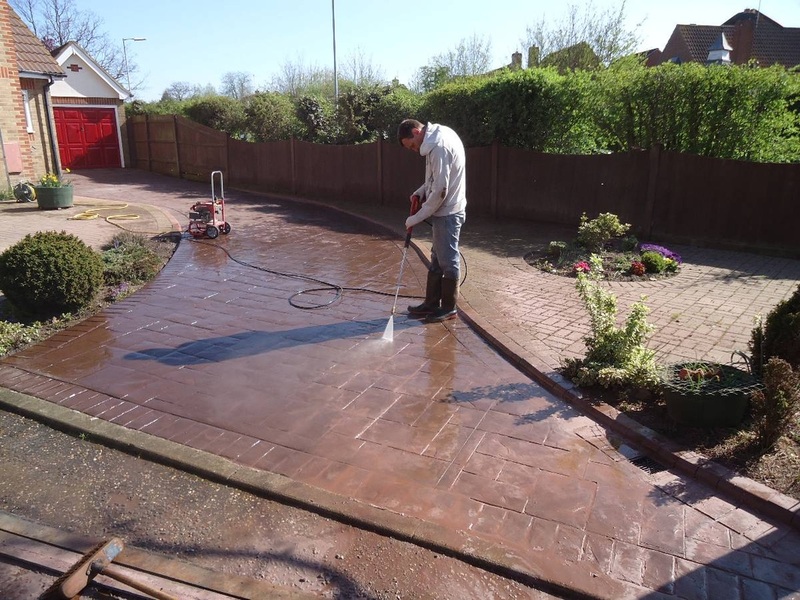 Once you've got your driveway looking weed free, keep it that way with an optional application of resin sealant will harden the joints and enhance the blocks colour. After the initial installation, cleaning is not recommended for up to four weeks. This will allow your pattern imprinted concrete driveway to reach maximum strength. 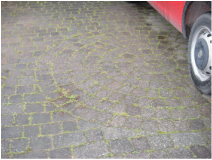 However, if oil is spilt on your drive then it should be cleaned up as quickly as possible.After this four week period has passed, your pattern imprinted driveway can be cleaned. It’s fine to use a power washer, but please ensure that it’s set on a wide fan. It isn’t always necessary to wash down your drive before re-sealing, unless it’s heavily soiled.